Every night before I go to bed, I get on my knees and thank God that my mother didn't bake this particular bun until well after the Baby Boom had ended. Has there ever been a more self-congratulatory, self-possessed, and self-obsessed group than that bunch? I certainly hope not. Sound harsh? Maybe, but that's the message I take from 1983’s The Big Chill. While the film contains some charms, it essentially comes down to nearly two hours of "deep talk" from a group of smug Boomers about their "ideals" and how they've changed since college. Reunited after many years at a funeral for one of their group, these friends mostly went on to become successful. Among the pals, we find a lawyer, a doctor, a magazine writer, a business owner, and a TV actor. Of the friends, the only ones who aren't considered raging successes are the housewife - though she clearly leads a very upper middle class life - and the drug dealer who was a success before he "lost his way". Although all these people do quite well for themselves - none of them ever ate any government cheese - they all seem unsatisfied because they fail to live up to their 1960s expectations of themselves. Lawyer Meg Jones (Mary Kay Place) intended to become a public defender and rescue the unjustly accused among the lower income levels, but then she realized just how - gasp! - guilty many of those people actually were and turned to a high prestige firm in Atlanta. Michael Gold (Jeff Goldblum) wanted to teach forlorn "ghetto kids" in Harlem, but somehow he lost his way and now he - gasp! - writes for People magazine. We’re supposed to view Goldblum as something of a failure because he works for People instead of something like the New Yorker, just as TV actor Sam Weber (Tom Berenger) becomes a buffoonish sell-out because he stars in a Magnum, PI-esque show. Well, excuse me if I forgot my hanky. I'll shed no tears or feel no sympathy for these folks. They all seem so self-pitying as they mope around and talk about what they had planned to do back in the '60s. I'm not entirely clear what the point of this film is, other than to try and convince aging Boomers that they really aren't such sell-outs after all. Because they wrapped the entire enterprise in such lofty and smug idealism and they seem to be so obsessed with their youth, these Boomers never actually entertain the notion that hey, it's okay to change your views as you age. It's no crime to see the world differently when you're forty than when you were twenty. These folks all seem to feel so guilty that they've done well for themselves, as though success is some kind of sin. They cling to their '60s dreams and they refuse to even remotely consider the possibility that these ideals failed because they weren't terribly realistic. Meg thinks she's a bad person because she went from seeing the criminals she assisted during her brief stint in a public defender's office as unfortunate victims to vicious scum. Maybe that change occurred because the real world opened her eyes to a reality that differed from her paternalistic college concepts. That's basically the outlook of the entire group. Occasionally drug dealer Nick Carlton (William Hurt) makes some comments that actually smack of some rational thinking, but he's meant to be viewed as bitter and cynical so we’re supposed to ignore whatever he says. Strangely, after all these ideas are bantered about and debated to death, nothing gets resolved until a good old fashioned bout of '60s free love gives us a happy ending. Even self-hating Nick decides to turn his life around once he gets some. Ain't that terrific! Chill takes a truly terrific cast and makes me dislike each and every one of them. Goldblum, Hurt, Kevin Kline, Glenn Close - these are some of my favorite actors, but I certainly don't much like them here. That's especially true for Kline, who uses an on-again/off-again Southern accent ineptly and comes across as the most smug of a pretty insufferable bunch. Chill doesn’t wind up as a totally worthless affair. The writing possesses some wit and flair and makes the film semi-watchable despite its annoying characters. Plus, at 106 minutes, it's over fairly quickly; if this thing had been half an hour longer, I don't think I could have made it. Despite those relative positives, The Big Chill remains a tough film to take. While made in a professional manner by talented people, it smacks of so much self-indulgence and smugness that it quickly becomes tiresome. 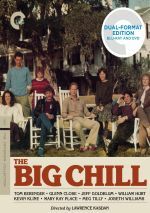 The Big Chill appears in an aspect ratio of approximately 1.85:1 on this Blu-ray Disc. Any problems here came from the source, as the transfer replicated the movie accurately. Sharpness was usually good. The film rarely looked terribly concise, but it showed appropriate delineation given the slightly hazy photographic styles chosen for the project. No issues with jagged edges or shimmering occurred, and edge haloes failed to materialize. With an appropriate layer of grain, I didn’t sense any digital noise reduction, and print flaws remained absent. Colors tended toward the subdued side of the street. The movie went with a fairly brownish look that didn’t seem dynamic but suited the tone of the story. Skin tones occasionally looked rather pink, which I suspect was a side effect of the early 80s film stocks. Blacks were fairly dark, while shadows seemed generally good. A few shots came across as a little dense, but again, that seemed to reflect the source. No one will use Big Chill to show off their awesome TVs, but the image gave us a good take on the original photography. In addition to the film’s original PCM monaural track, Chill came with a DTS-HD MA 5.1 remix. In regard to the latter, the soundscape lacked much ambition. Music broadened to the sides in a moderate manner, and occasional effects spread to the various speakers. For instance, vehicles moved from one spot to another in a passable manner. None of this opened up the track particularly well, though. Honestly, I’m not sure why a heavily character-based film like this warranted a multichannel remix, as the minor added dimensionality seemed superfluous. Audio quality was fine for its era. Speech seemed fairly natural and concise, without obvious defects. Effects came across as reasonably accurate; those elements lacked much range but showed adequate clarity. Music offered the most bang, as the 1960s music boasted pretty good punch. Nothing here impressed but the mix worked fine for the film. I also examined the monaural track and found it to resemble the 5.1 mix in many ways. Quality remained similar, as I discerned no obvious sonic differences between the two. If I watched the movie again, I’d go with the mono track because a) I usually prefer original mixes, and b) the 5.1 version added so little to the soundscape. Fans who pick the multichannel track won’t find any obvious problems with it, though. How does this Blu-ray compare with the original DVD from 1999? Audio was a wash; the lossless mix offered a bit more depth but remained restricted due to the nature of the source. Visuals showed a more obvious boost, though. Even with the limitations of the original photography, the Blu-ray seemed tighter, cleaner and more natural. The Blu-ray comes with a mix of old and new extras. In the latter category comes Success in the System, an interview with writer/director Lawrence Kasdan. During the 12-minute, 19-second piece, Kasdon discusses aspects of his career and Big Chill. It’s a decent chat but not as informative or revealing as I might’ve liked. Also found on the old DVD, A Reunion goes for 56 minutes, five seconds and offers notes from Kasdan, writer Barbara Benedek, music consultant Meg Kasdan, editor Carol Littleton, executive producer Marcia Nasatir, production designer Ida Random, director of photography John Bailey, and actors William Hurt, Glenn Close, JoBeth Williams, Kevin Kline, Tom Berenger, Meg Tilly, Mary Kay Place, and Jeff Goldblum. The documentary looks at the project’s origins and development, music, story/character areas, cast and performances, sets and locations, camerawork, deleted scenes and various anecdotes about the shoot. The absence of a commentary disappoints me, but “Reunion” does a lot to compensate. While not the most dynamic piece, it covers various issues well and comes with a nice variety of stories. I think it’s considerably more entertaining than the movie itself. New to the Criterion set, a Thirtieth Anniversary Q&A lasts 43 minutes, 57 seconds and features Lawrence Kasdan, Meg Kasdan, Berenger, JoBeth Williams, Meg Tilly, Marcia Nasatir, Barbara Benedek, Mary Kay Place, Kevin Kline, Glenn Close and producer Michael Shamberg. The Q&A looks at the film’s roots and development, story and characters, cast and performances, music, Kevin Costner and deleted scenes, and various thoughts. While decent on its own, the Q&A feels more than a little redundant after “Reunion”, as it gives us a lot of the same info. It also suffers from bad recording, as we can’t hear the questions from the audience; we have to infer their queries from the replies, which can be tough. Some decent notes emerge and Kline amuses, but the Q&A seems lackluster overall. In addition to the film’s trailer, five Deleted Scenes occupy a total of nine minutes, 39 seconds. The longest shows the gang as they meet up at Alex’s funeral; it focuses on Michael and goes for a fairly comedic bent. We also see various characters as they shovel dirt on Alex’s grave, early stages of the folks at Harold and Sarah’s place, another video diary with Michael and a short bit after the end of the touch football game. These seem forgettable, and the absence of the semi-legendary Kevin Costner scene disappoints. Finally, the package presents a 20-page booklet. This brings us a new essay from filmmaker Lena Dunham as well as a 1983 Film Comment article from Harlan Jacobson. As usual, the booklet complements the set. Although it has some decent humor at times, too much of The Big Chill focuses on the incessant navel-gazing of fatuous Baby Boomers. A little of that goes a long way, so the characters wear out their collective welcome long before the film ends. The Blu-ray brings us representative picture and audio along with a small but informative set of bonus features. I appreciate the good work Criterion did with this release but none of that makes the movie more enjoyable.